There are many different possibilites how to explore the desert by foot. We offer hikes of 3 or 4 hours or less, through the narrower valleys and canyons and we usually combine these hikes with jeep rides. This is very popular, since this way our guests get to see many sights by jeep as well as getting to enjoy a walk through the beautiful landscape. You can also combine a daily hiking trip with a one day long jeep tour and/or one day on a camel. See the jeep/hike programme and the jeep/hike/camel. For dedicated walkers we also offer a full day's hiking, with no jeep at all. You might like to look at the page "One day (or more) hiking". Every programme can be combined with others. 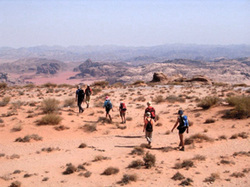 For those who want to spend a whole week in Wadi Rum we also offer combinations of hiking trips with simpler scrambling. Many groups coming from tourist agencies give us a good feedback on our week long trekking tours in Wadi Rum. Footwear: These trails are flat and therefore hiking boots are not necessary, so you can wear footwear which is comfortable enough for a few hours in the desert. Other equipment : Because you will be in the sun for most of the time you should cover your head somehow - this would be an opportunity to learn how to tie a Bedouin kefiya! You should bring a backpack or shoulder bag for water, and other things like your camera, sunscreen, a light sweater depending on the season and perhaps a small snack. If you have different wishes or ideas we can always arrange something for you personally! There are a number of possibilities to discover Wadi Rum. Look for our one day and two day programs and three and more day programs. You can find our general information about our tours here. If you are traveling alone please send us a message and we will try our best to find a tour you can join to reduce the costs and make it as comfortable for you as possible.